Yo dawg, I heard you like scramblin’. Modifications play an important part in the history of scramblers. Original scramblers in the 60s and 70s were standard bikes heavily modified by the owner that allowed them to tackle rugged terrains. When it introduced the Scrambler 1200, Triumph promised a return to the roots of scrambling, offering us a bike meant to be more capable off the roads. Adding to the “scrambler” tradition, Triumph is now providing owners with the possibility to retrofit a flight of accessories on their new Scrambler with the Escape and Extreme Inspiration kits. 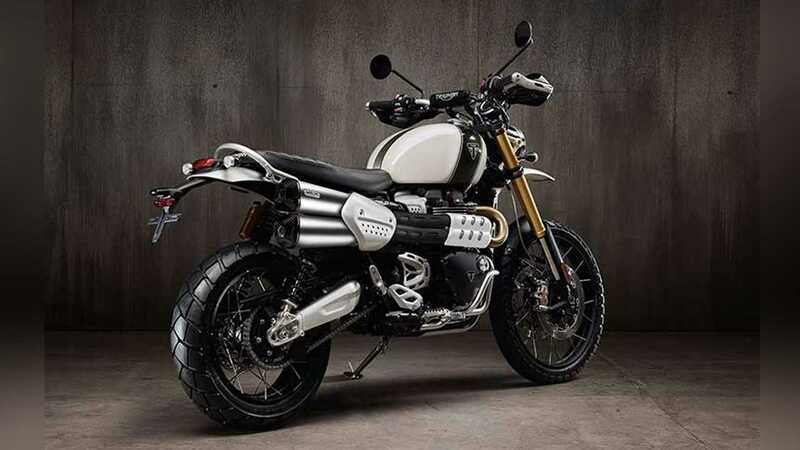 The new Scrambler 1200 XC and XE have already been equipped with some of the basic features the make a scrambler, well, a scrambler: braced handlebar, flat saddle, skid plate, spoke wheels with knobby tires, high set exhaust, adjustable twin-spring rear suspension, etc. 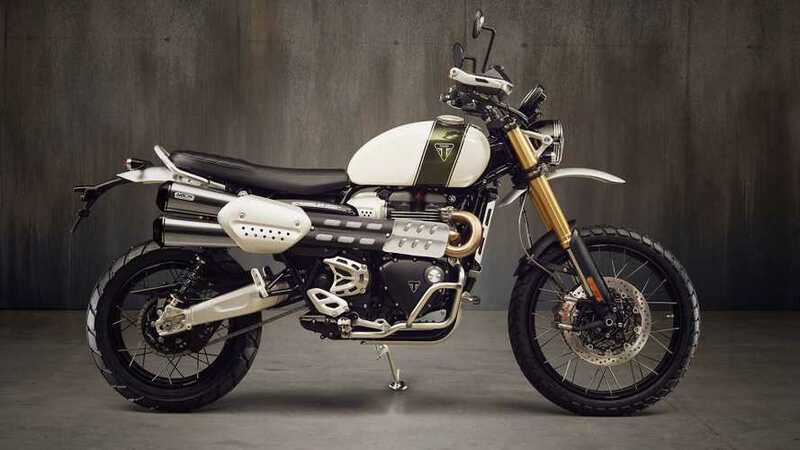 Triumph has now launched two new Inspiration kits that further the Scrambler dual-purpose personality. The Escape kit is oriented towards making the Scrambler the optimal tourer by adding extra storage and convenience to the bike. The kit includes a set of handguards (standard on the XE model), a set of saddlebags with fitting kit, grab rack kit, LED fog lights, a practical center stand, as well as a flyscreen with all its hardware. The Extreme kit takes things a step further, meant to add some brawn to the bikes off-road capability. 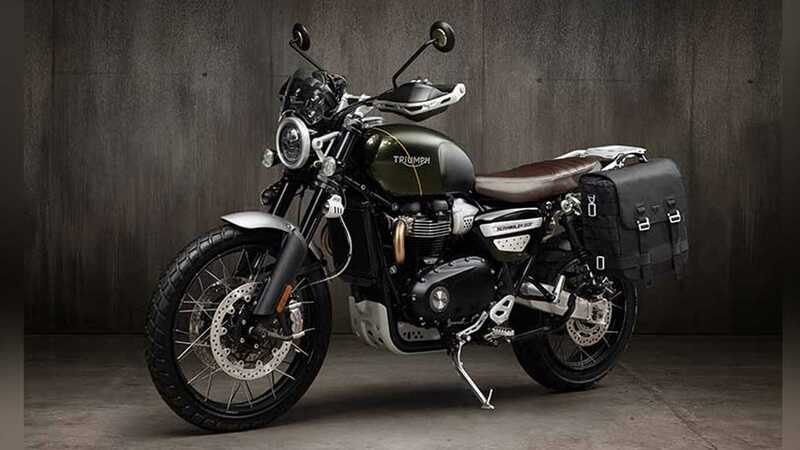 It includes a high-set front mudguard, Carbon Arrow exhaust tip, an aluminum radiator guard, machined oil filler cap, a black brace for the handlebar, LED indicators and taillight relocation kits, an extension for the side stand foot, stainless steel dresser bar, and a headlight grille and bezel. Triumph adds that there are over 80 accessories that are offered to clients wishing to modify their bikes. The options for customization are there, which ones will you choose: touring or off-roading?